This SunKissAlba x DERMA E signature facial oil contains Jojoba, Argan, and Seabuckthorn oils, plus Mica for a natural shimmer. Be Sunkissed! I'm SunKissAlba and I'm passionate about organic beauty and sustainable living. I love face oils to help soften, illuminate and add nourishing hydration to my skin. 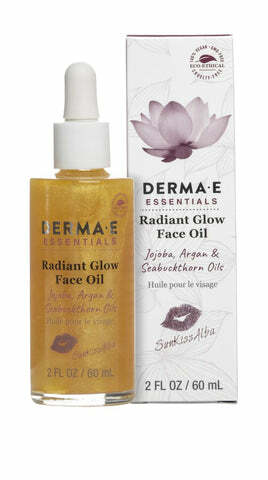 I've worked with DERMA E on this luxurious oil to create an unforgettable glow. Luscious organic Jojoba Oil and replenishing organic Argan Oil moisturize to help combat dehydration and the appearance of wrinkles while promoting radiance. Rejuvenating organic Seabuckthorn Oil helps to smooth and add shine while mineral-rich mica adds a natural-looking brilliance to your skin. Organic Helianthus Annuus (Sunflower) Seed Oil*, Organic Simmondsia Chinensis (Jojoba) Seed Oil*, Ethylhexyl Palmitate, Organic Cucurbita Pepo (Pumpkin) Seed Oil *, Organic Hippophae Rhamnoides (Seabuckthorn) Fruit Oil*, Organic Argania Spinosa (Argan) Kernel Oil*, Tocopheryl Acetate (Vitamin E), Mica, Titanium Dioxide, Natural Fragrance Oils. Shake well. For a radiant glow, massage 2-3 drops onto clean skin. Apply day and night or as desired. DERMA E is constantly striving to lessen our impact on the environment and improve our conservation efforts within our organization and we believe we should all do our part to make a positive difference in the sustainability of our world. Everything we do considers people, the planet and our purpose. Not only do we care about what we put on and in our bodies, but also about what eventually ends up in our waters and ecosystems. That’s why our packaging components are recyclable and we offset 100% of conventional electricity use with wind energy certificates. We formulate our Natural Mineral Sunscreens with ingredients identified as safe for coral reef ecosystems. We use nano-particle-free, chemical-free broad spectrum Zinc Oxide, tested and proven to be reef safe. As a company, we believe in our collective power to make positive changes in our world, and we are guided by our will to make a meaningful difference. Each and every DERMA E purchase helps to support global communities and the environment. With that said, we proudly support the Paraguay Project, Vitamin Angels, World Wildlife Fund, Heal the Bay and Special Olympics: Ventura County.